Lost & Found: Trailer from Goldy on Vimeo. After a successful film festival run Directors Andrew Goldsmith and Bradley Slabe and Producer Lucy Hayes' beautiful animated short film "Lost & Found" recently took home the Best Short Animation Award at the AACTA’s and has just been shortlisted for a 2019 Academy Award. "Lost & Found" shares an adorable yet tragic love story between a knitted dinosaur and a fox. 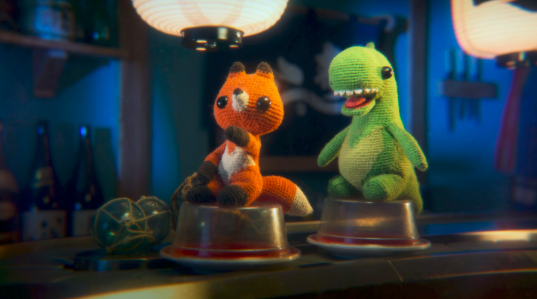 A bumbling knitted dinosaur must completely unravel itself to save the love of its life. Andrew Goldsmith has created award winning films and television content, most recently a short for Sesame Street. With ten years experience in animation/VFX and directing shorts and music videos, he has developed a stylistically striking voice that has been honoured by the likes of SXSW and Rolling Stone Magazine. Bradley Slabe is a Gold AWGIE winning screenwriter and director. Bradley honed his craft working in story development for features such as Maya the Bee Movie and is now a writer of children's film and television for the international screen, most recently the critically acclaimed Kitty is not a Cat. Lucy Hayes’ films have played at high profile festivals around the world, her television credits include the animated series Supa Phresh for Nickelodeon, and the Screen Australia funded web series Movement. In 2016, she was awarded a coveted Creative Talent Suite Placement at Lin Pictures in Hollywood. Lucy worked across the development of Disney's live action Aladdin, production of the LEGO films and Stephen King's IT. Lucy is currently developing Main Street, a television series based on the best selling novels by Ann M. Martin. After premiering at the Berlin International Film Festival, "Lost & Found" went on to win the Yoram Gross Animation Award at Sydney Film Festival, Audience Award for Best Animated Short at Austin Film Festival and is nominated for the prestigious Annie Awards in early 2019. The Oscar nominations will be announced on January 22, 2019.